F shaped bar clamp, suitable for a wide range of woodworking, machine repair, DIY projects, etc. Suitable for a wide range of woodworking, machine repair, DIY projects, etc. Anti-slip ergonomics handle provides comfortable and stable operation. Zinc plating rail, not easy to rust. Protective pads for both tops can well protect wood pieces. Total Qty with this auction: 2 clamps. Adjust from 0" to 24". 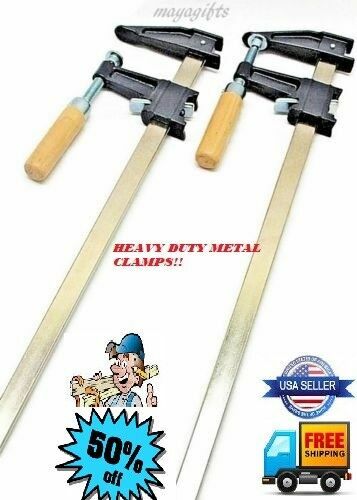 Perfect for all of you clamping needs. Maya Gifts was started in Fort Wayne, Indiana in 2006. Our mission has always been to purchase a wide variety of consumer goods directly from manufacturers and deliver them to our buyers at the absolutely best prices anywhere. In order to achieve that we cut out all non-essential steps in our procurement process, we buy in large quantities, we own and warehouse all of our items and keep our margins to a minimum. Add our store to your favorites and receive our email newsletter about new items and special promotions! Copyright © 2017 MAYAGIFTS. All rights reserved.